The off season training camps for winter 2018-2019 will take place in Los Cristianos, Tenerife. 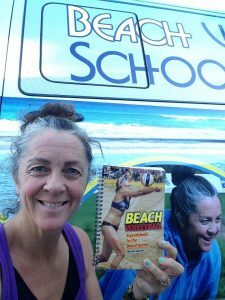 Our camps are fun, friendly, social and influential and aimed at the already committed beach volleyball player who has the stamina to last five intensive days of coaching and playing. This camp is for a small group of friends who would like a week of coaching with Denise Austin without the large camp groups. Please email or telephone to make this week a reservation for your group. Beginner or advanced it doens’t matter as long as your group wants to train together. Our aim is to make sure all the coaches are taking a keen interest in your personal development. As coaches we factor in our time to debrief about every individual daily and then create training suited to individual needs; this is a coaching camp for you not only to learn new drills and work hard but to understand your own mechanics and be able to go home with new knowledge to apply beyond the training. Open courts available the day before the camp officially starts 11:00-16:00. Open Courts the day after the camp finishes 11:00-16:00. To book your coaching offline or to discuss details please contact Denise Austin on 0777 33 82 305 or email Denise. Please feel free to use our local agent Matteo and Conchie through Lighthouse Accommodation Tenerife who are beautifully reliable and very helpful. Payment must be made within 48 hours to secure the booking, if you need to make other arrangements please do email denise@beachvolleyballinc.com BACS £225 Paypal +4% at checkout for the Camp Admission. To keep prices down, we have kept the camp price the same but if you would like more camp kit this can be ordered at the registration. For an idea of our camps and the location please see the video from one of our camp supporters – Rasmus , Thank You! Data: We take your welfare seriously. All data collected is to make sure we are able to contact your quickly and immediately in case of emergencies. We also make sure we have access to your nearest and dearest only if anything happens to you. We need to keep you updated about your camp with general information about whats happening, social media groups/whats app etc. The collected information is only for use surrounding the camp. Your email will be added to mail chimp for Beach Volleyball Inc. bulletins and camp info. You can easily unsubscribe at any point.